The National Transportation Safety Board (NTSB) is an independent U.S. government investigative agency responsible for civil transportation accident investigation. In this role, the NTSB investigates and reports on aviation accidents and incidents, certain types of highway crashes, ship and marine accidents, pipeline incidents, and railroad accidents. When requested, the NTSB will assist the military and foreign governments with accident investigation. The NTSB is also in charge of investigating cases of hazardous materials releases that occur during transportation. The agency is based in Washington, D.C. As of December 2014[update], it has four regional offices located in Anchorage, Alaska; Denver, Colorado; Ashburn, Virginia; and Seattle, Washington. The agency also operates a national training center at its Ashburn facility. 490 L'Enfant Plaza SW, Washington, D.C. The origin of the NTSB was in the Air Commerce Act of 1926, which assigned the United States Department of Commerce responsibility for investigating domestic aviation accidents. Before the NTSB, the FAA (then the CAA) independence was questioned as it was investigating itself and would be biased to find external faults, coalescing with the 1931 crash killing Notre Dame coach Knute Rockne. The USA's first "independent" Air Safety Board was established in 1938: it lasted only fourteen months. In 1940, this authority was transferred to the Civil Aeronautics Board's newly formed Bureau of Aviation Safety. To avoid any conflict, Congress passed the Independent Safety Board Act, and on April 1, 1975, the NTSB became a fully independent agency. As of 2015[update], the NTSB has investigated over 140,000 aviation incidents and several thousand surface transportation incidents. Formally, the "National Transportation Safety Board" refers to a five-manager investigative board whose five members are nominated by the President and confirmed by the Senate for five-year terms. No more than three of the five members may be from the same political party. One of the five board members is nominated as the Chairman by the President and then approved by the Senate for a fixed 2-year term; another is designated as vice-chairman and becomes acting chairman when there is no formal chairman. This board is authorized by Congress under Chapter 11, Title 49 of the United States Code to investigate civil aviation, highway, marine, pipeline, and railroad accidents and incidents. This five-member board is authorized to establish and manage separate sub-offices for highway, marine, aviation, railroad, pipeline, and hazardous materials investigations. Collectively, "National Transportation Safety Board", the "Safety Board" or "NTSB" is used to refer to the entire investigative agency established and managed by this five-member board. As of 2017[update], Robert Sumwalt is chairman of the NTSB. Since its creation, the NTSB's primary mission has been "to determine the probable cause of transportation accidents and incidents and to formulate safety recommendations to improve transportation safety (in the USA)". Based on the results of investigations within its jurisdiction, the NTSB issues formal safety recommendations to agencies and institutions with the power to implement those recommendations. The NTSB considers safety recommendations to be its primary tool for preventing future civil transportation accidents. However, the NTSB does not have the authority to enforce its safety recommendations. The NTSB is the lead agency in the investigation of a civil transportation accident or incident within its sphere. An investigation of a major accident within the United States typically starts with the creation of a "go team," composed of specialists in fields relating to the incident who are rapidly deployed to the incident location. The "go team" can have as few as 3–4 people or as many as a dozen, depending on the nature of the incident. Following the investigation, the agency may then choose to hold public hearings on the issue. Ultimately, it will publish a final report which may include safety recommendations based on its findings. The NTSB has no legal authority to implement or impose its recommendations, which must be implemented by regulators at either the federal or state level or individual transportation companies. Marine: For marine investigations, jurisdiction into investigations is divided between the NTSB and the U.S. Coast Guard. The division of investigative jurisdiction and responsibilities is prescribed in a detailed Memorandum of Understanding between the two agencies. Assistance to criminal investigations: The NTSB has primary jurisdiction over civil transportation investigations, but not criminal investigations. If the Attorney General declares the case to be linked to a criminal act, the NTSB must relinquish control of the investigation to the Federal Bureau of Investigation. The NTSB may still provide technical support to the FBI in such investigations. In two high-profile examples, the NTSB sent aviation accident investigators with knowledge of aircraft structures and flight recorders to assist the FBI's criminal investigation into the murder-suicide of Pacific Southwest Airlines Flight 1771 in 1987, and the September 11, 2001 attacks fourteen years later. Assistance to other domestic agencies: In addition to assisting the Department of Justice in criminal investigations, the NTSB has also assisted the National Aeronautics and Space Administration (NASA) in its investigations of both the Challenger and the Columbia space shuttle disasters. The NTSB also provides assistance on request to the U.S. military in its investigation of military incidents within the realm of the NTSB's expertise, such as the crash of an Air Force transport plane in former Yugoslavia that took the lives of more than 30 Americans, including Commerce Secretary Ron Brown. Assistance to foreign governments: The NTSB may assist in incident or accident investigations occurring outside the United States under certain circumstances. These may include accidents or incidents involving American-registered or American-owned civil aircraft or aircraft with U.S. manufactured components in foreign air space. Officially, NTSB employees are prohibited from releasing information about "another country's investigation". The NTSB will also on occasion provide technical and other advice to transportation investigative boards in countries that do not have the equipment or specialized technicians available to undertake all aspects of a complex investigation. Significant investigations conducted by the NTSB in all modes of transportation in recent years include the collapse of the I-35W highway bridge in Minneapolis, Minnesota; the collision between two transit trains in Washington, D.C.; the pipeline explosion that destroyed much of a neighborhood in San Bruno, California; the sinking of an amphibious vessel in Philadelphia; and the crash of a regional airliner near Buffalo, New York. The NTSB considers the party system crucial to the investigative process, as it provides the NTSB with access to individuals with specialized expertise relevant to a particular investigation. However, use of the party system is not without controversy. The NTSB invited The Boeing Company to participate as a party to the investigation of the crash of TWA Flight 800, a Boeing 747, in 1996. While the NTSB relied on Boeing's sharing of expertise, it was later determined that Boeing had withheld from the NTSB a study of military versions of the 747 that investigated flammable vapor combustion in the center fuel tank. Boeing had told the NTSB that it had no studies proving or disproving the vapor combustion theory. In response to political pressure after the Boeing incident, the NTSB commissioned the nonprofit Rand Corporation to conduct an independent study of the NTSB's aircraft investigation process. In 2000, Rand published its report, which concluded that the party system is "a key component of the NTSB investigative process" and that participant parties "are uniquely able to provide essential information about aircraft design and manufacture, airline operations, or functioning of [the National Airspace System] that simply cannot be obtained elsewhere". :31 However, Rand also found conflicts of interest inherent in the party system "may, in some instances, threaten the integrity of the NTSB investigative process". :30 The Rand study recommended that the NTSB reduce its reliance on party representatives and make greater use of independent investigators, including from NASA, the Department of Defense, government research laboratories, and universities. :31–32 As of 2014[update], the NTSB has not adopted these recommendations and instead continues to rely on the party system. Mid-air collision avoidance technology, ground proximity warning systems, airborne wind shear detection and alert systems, smoke detectors in lavatories and fuel tank inerting. Recreational boating safety, improved fire safety on cruise ships, and lifesaving devices on fishing vessels. A little-known responsibility of the NTSB is that it serves as a court of appeals for airmen, aircraft mechanics, certificated aviation-related companies and mariners who have their licenses suspended or revoked by the FAA or the Coast Guard. 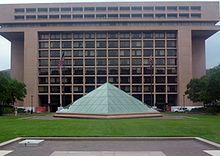 The NTSB employs administrative law judges which initially hear all appeals, and the administrative law judge's ruling may be appealed to the five-member Board. The Board's determinations may be appealed to the federal court system by the losing party, whether it is the individual or company, on the one hand, or the FAA or the Coast Guard, on the other. However, from Ferguson v. NTSB, the NTSB's determinations are not overturned by the federal courts unless the NTSB abused its discretion, or its determination is wholly unsupported by the evidence. The Safety Board maintains a training academy in Ashburn, Virginia, where it conducts courses for its employees and professionals in other government agencies, foreign governments or private companies, in areas such as general accident investigation, specific elements of investigations like survival factors or human performance, or related matters like family affairs or media relations. 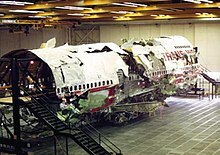 The facility houses for training purposes the reconstruction of more than 90 feet of the TWA Flight 800 Boeing 747, which was recovered from the Atlantic Ocean after it crashed on July 17, 1996, following a fuel tank explosion. ^ a b c d e "We Are All Safer: Lessons Learned and Lives Saved 1975–2005. 3rd ed. Safety Report NTSB/SR-05/01" (PDF). National Transportation Safety Board. Retrieved December 18, 2015. ^ a b c d Office of the Chief Records Officer (December 19, 2014). "Records Management Oversight Inspection Report 2014" (PDF). National Archives and Records Administration. Retrieved December 20, 2015. ^ a b "NTSB Training Center". National Transportation Safety Board. Retrieved December 20, 2015. ^ a b c "History of The National Transportation Safety Board". National Transportation Safety Board. Retrieved December 20, 2015. ^ William Tuccio (November 8, 2018). "Opinion: When A Near-Accident Requires Deeper Investigation". Aviation Week & Space Technology. ^ a b "A Brief History of the FAA". Federal Aviation Administration. Retrieved December 20, 2015. ^ a b c d "National Transportation Safety Board". The Free Dictionary. Retrieved September 15, 2014. ^ a b c d e "Annual Report to Congress 2014" (PDF). National Transportation Safety Board. Retrieved December 18, 2015. ^ "The Investigative Process". National Transportation Safety Board. Retrieved December 20, 2015. ^ "NTSB Providing Technical Assistance to FBI Investigation" (Press release). National Transportation Safety Board. September 13, 2001. Retrieved December 19, 2015. ^ Horikoshi, Toyohiro. "U.S. leaked crucial Boeing repair flaw that led to 1985 JAL jet crash: ex-officials." Japan Times – Kyodo. (August 11, 2015). ^ a b "What is the National Transportation Safety Board?" (PDF). National Transportation Safety Board. Retrieved May 11, 2016. ^ a b c Alvear, Michael (December 6, 1996). "Crash course in ethics". Salon. Retrieved May 11, 2016. ^ a b c "Safety in the Skies: Personnel and Parties in NTSB Aviation Accident Investigations" (PDF). RAND Corporation. January 1, 2000. ^ "Unchecked carnage: NTSB probes are skimpy for small-aircraft crashes". USA Today. June 12, 2014. Retrieved May 11, 2016. ^ a b "Office of Administrative Law Judges". National Transportation Safety Board. Retrieved December 21, 2015. ^ Hall, Jim (December 8, 1997). "Statement at the Opening of the NTSB Investigative Hearing Into the Crash of TWA Flight 800". NTSB. Retrieved July 5, 2017. Wikimedia Commons has media related to National Transportation Safety Board. Rimson P.E., Ira J. Investigating "Causes". International Society of Air Safety Investigators, ISASI '98, Barcelona, Spain; October 20, 1998.